Ally McCoist handed in his notice after becoming increasingly alarmed at the number of staff losing their jobs at Rangers. The manager has been physically and emotionally drained by events at the club, including the departure of long-standing administration and ground staff. McCoist was also assured that no employees at Murray Park would be affected, only for some to later be told that they would be losing their jobs. He will now work his 12-month notice period, unless the board decide to settle his contract or put him on gardening leave. 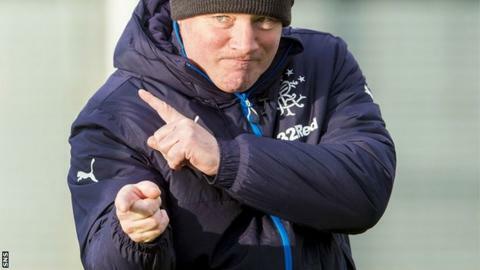 The BBC has learned that the decision has been playing on McCoist's mind for several weeks. He has grown increasingly concerned at events at the club, with several staff being made redundant in recent weeks. The accounts revealed an £8m loss for the financial year to the end of June 2014 and the directors outlined that at least £8m will be required in fresh funding from January to keep the business going for another 12 months. "He's had enough of seeing decent, honest people with Rangers in their heart losing their jobs." Derek Llambias, the former Newcastle United managing director and long-time ally of Mike Ashley, has been playing a prominent role at Ibrox ever since the Magpies and Sports Direct owner provided the club with £3m in loans. Ashley holds a stake of around 9% in Rangers International Football Club and Llambias has since been appointed to the board as a non-executive director. Yet, when Ashley took his initial shareholding in RIFC, he agreed an undertaking with the Scottish Football Association that he would not hold more than 10% and would not have influence on the board. McCoist has revealed that discussions in recent weeks on possible transfer activity in January were held with Llambias. Llambias, along with Sports Direct's Barry Leach, have been assessing the financial and staffing arrangements at Ibrox in recent weeks and been prominent around the stadium as staff were made redundant. The staff who lost their jobs were not high earners - among them were the long-standing secretary to the manager and a groundsman - and McCoist came to feel that he should hand in his own notice. He is also aware that some board members have long wanted him replaced and McCoist wanted to take the initiative himself rather than wait for others to eventually decide his fate. "He's had enough of seeing decent, honest people with Rangers in their heart losing their jobs," a source told the BBC. "The club has been haemorrhaging money and these people losing their jobs won't make a significant difference to that. "This is not him walking away. He has just handed in his notice. He needs some time out to recharge his batteries, but he will continue to help Rangers and Rangers supporters as much as he can. "If someone with Rangers in his heart feels he has to take this step then he hopes others who have been in and around events at the club in recent years will do the same. "I can't think of any other manager who has had to put up with administration, liquidation, Whyte, Green and everything else that has gone on at Rangers." McCoist has been drained by events behind the scenes at Rangers but remains emotionally committed to the club. He is also a shareholder in Rangers International Football Club.